Over and over again, people come to me, and they tell me, ‘You just don’t know how strong I am.’ They say ‘strength’ and I want to hear ‘balance.’ The strength idea has effort in it; this is not what I’m looking for. Strength that has effort in it is not what you need; you need the strength that is the result of ease. Greek mythology tells of the great hero Hercules & his Twelve (in)Famous Labors. After slaying the Nemean Lion & purging the Augean Stables, among other labors, the hero was faced with yet another seemingly insuperable task: to pluck a golden apple from a magic tree (that Hera had given to Zeus as a wedding gift) & present the aureate fruit to Eurystheus, to whom Heracles was indentured. The apples grew in Garden of the Hesperides, the latter being nymphs who guarded Hera’s gift & who were daughters to Atlas, the Titan whose plight it was to hold the entire Earth and the sky upon his shoulders, lest the waters & the firmament should again into the primordial Chaos. Incidentally, the sayd apples were also guarded by an hundred-headed dragon called Ladon AND Hercules had altogether no idea where to find them. After roving about the Mediterranean & partaking in a merry slew of grappling-bouts with divers opponents, Hercules finally stumbled upon the old titan Prometheus who, as retribution from Zeus for having brought to mankind the knowledge of fire, had been chained to Mount Caucasus in such a vulnerable position that a voracious eagle had free access to his viscera. The demonic bird had established a habit of breaking its fast on the the enchained Titan’s liver, the latter which grew back each night on account of the supernatural regenerative capacity of Prometheus’ organism (some one-hundred & fifty-fold outperforming the commensurate rejuvenation by the body of a mere mortal: to wit, the human livers regenerates itself after 3 months). Given the Titan’s plight, however, this extraordinary corporal vigour was more of a bane than a blessing since the new liver only encouraged an insatiable taste for organ-meat in the voracious bird of prey. Coming upon the scene, Hercules vanquished the eagle, the latter being no match for the supernatural might of such a demi-god. In appreciation for his deliverance, Prometheus divulged to his rescuer the whereabouts of the Garden of the Hesperides, as well as a surefire tactic to procure its prizèd fruits. Following Prometheus’ counsel, Hercules then journeyed to the place where Atlas sustained the world on his shoulders. Hercules addressed the Titan & persuaded him to retrieve the golden apples himself, since the nymphs were his daughters & the hundred-headed dragon was his house-cat. Atlas, eager at the opportunity to shirk his burthen, hastily acceded. So Hercules took the load & the Titan went to fetch the fruits. On his way back, it occurred to Atlas, however, what a welcomed relief it was to have the weight of the world divested from his shoulders. 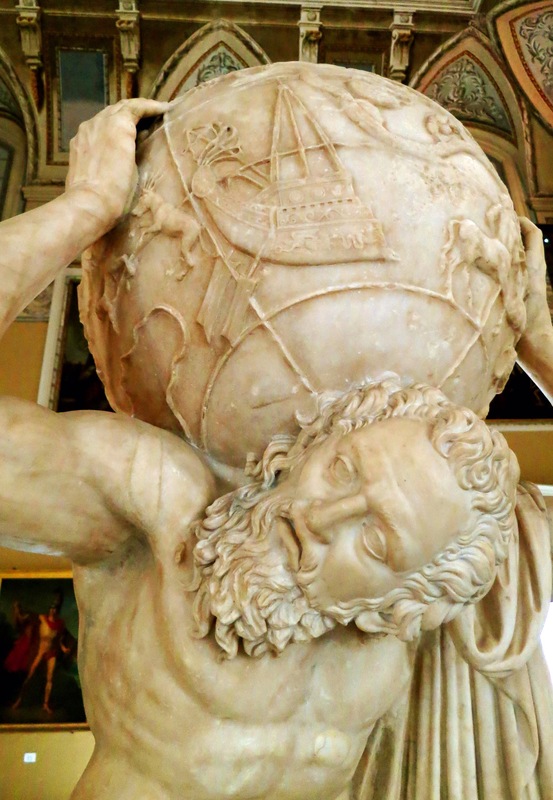 For this reason, upon returning, Atlas declared to Hercules his intention not to fulfill his end of their arrangement. The hero, unsurprised by the Titan’s treachery, nominally capitulated to Altas’ enunciation. Unlike his counterpart, however, Hercules’ brawn did not come at the expense of his brains & Hercules, therefore, petitioned one small request: that he be allowed to adjust his toga before resuming the weighty world on his shoulders for all eternity. Basking in the prospect of having outwitted the toga-clad demi-god, Atlas agreed to Hercules’ entreaty. Atlas took up the world again, the golden apples passed to the hands of Hercules, & with that the hero set off on his return journey. Atlas, meanwhile, could hardly lift a finger to hinder him because all of the Titan’s redoubtable brawn was invested in bearing that colossal terraqueous globe. In this Greek myth, we observe a scarcely concealed parable of the interplay between tension or force, & potential in body & soul. Whichsoever of these supermen was to bear the world, in spite—& because—of the immensity of the feat, could not concurrently do anything else. Likewise, in a more pedestrian example, if I spend my entire day holding my shoulder-blades up to my head like a pair of ossiferous earrings, not only is it poor taste, but I will also find myself too exhausted to take my pet monkey for a walk in the park in the afternoon, play with my kids after work, write didactic website-posts, or volunteer at the homeless shelter. It’s hardly even a trade-off because I don’t stand to gain anything except a headache. Similarly, many of us work very hard just to stay upright on our two feet. This feat (given the tenuous verticality that bipedalism engenders in the human condition) is not without merit. Nevertheless, there are more & less strenuous ways of managing it. For this reason, Ida Rolf encourages us to seek a strength that is the result not of effort but of balance; not of brawn but of ease. Through the process of Rolfing® Structural Integration, therefore, we liberate our body’s resources by divesting it of superfluous tension. In the resulting energy, we find the freedom to engage in the pursuits we care about.